If you’ve never tried fried lemons before, you must. We don’t want you to miss out on these tasty treats! They’re tangy, sweet, savory, and best of all, crunchy, all at the same time!! 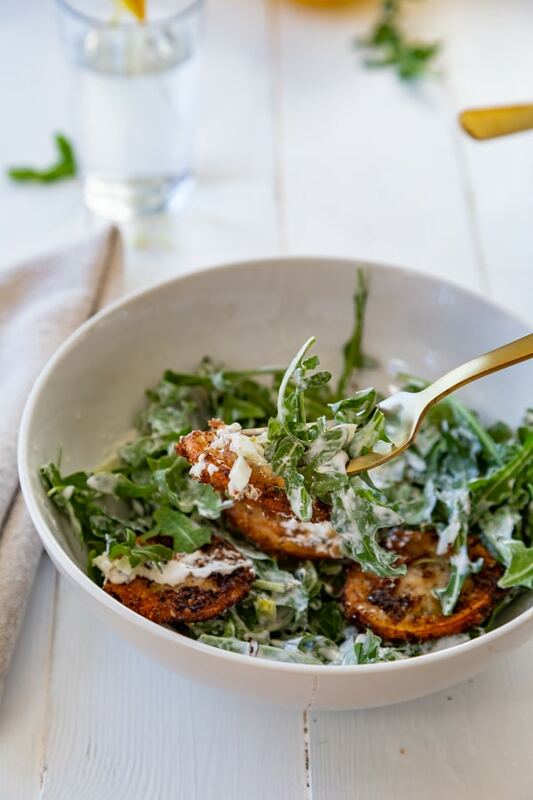 When they’re added to a salad with peppery arugula, fennel, and our tangy lemon dressing, we guarantee that there won’t be a bit of salad left on your plate. 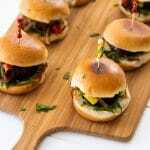 We’ve updated this recipe to make it even better for you! This post contains Amazon affiliate links. Purchases made through these links help support Veganosity.com at no additional cost to you. The first time I had the pleasure of eating fried lemons was at an Italian restaurant in Chicago. One bite and I was hooked. They may sound odd, but believe me, they’re outrageously good. The process of frying them takes away the sour notes and leaves a hint of tanginess with sweet, and the bitterness of the rind disappears as well. What you’re left with is a nicely caramelized lemon slice that still has a lovely lemon flavor, yet it’s slightly sweet, savory, and crispy. Pure foodie heaven! During the process of frying the lemons the natural sugars are released and the excessive tartness disappears. Even if you’re not a big lemon fan, these are definitely worthy trying. 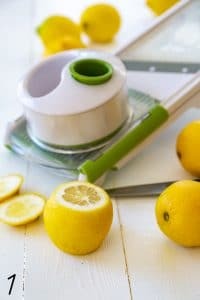 HOW DO YOU FRY LEMONS? Prepare the lemon. Choose unwaxed lemons with a thin skin. Meyer lemons work well. Wash them well and thinly slice them. Remove seeds if necessary. 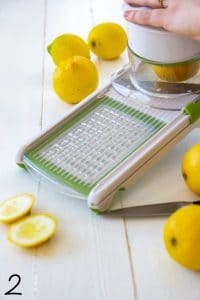 A mandolin is a great kitchen tool to ensure that the slices are even. We use the one below. Dredge the lemons in the milk and breadcrumbs. Put the milk in a shallow bowl and season the breadcrumbs and spread it out on a plate. 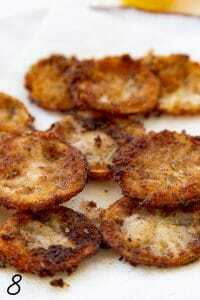 Dip the lemons in the milk, then dredge them in the breadcrumbs on both sides and shake the excess off. The coating may not stick on the entire lemon, that’s fine. Make sure the oil is hot. Heat the oil (find out what oil to use below) on high in a heavy pan or a cast-iron skillet. When the oil is hot enough to fry (test it by putting adding the smallest slice, if it sizzles, it’s ready), add the lemon slices to the pan with tongs so you don’t burn yourself. The oil should never smoke, if it starts to, turn the heat to medium-high. Fry the lemon slices for approximately 1 to 2 minutes, or until they’re golden brown. Transfer to a wire rack that’s lined with paper towels to absorb excess oil. My mother always fried food in Crisco. I, on the other hand, prefer vegetable for deep frying and olive and avocado oil for light frying and sautéing, and here’s why…. Flavor. There’s not a lot of flavor in vegetable oil. Coconut oil, sesame oil, peanut oil, even olive oil have a distinct flavor. Smoke Point. Vegetable oil’s smoke point is around 450°F (232°C). You don’t want the oil to smoke, because that means it’s starting to burn, which is not only unhealthy, but it will ruin the taste of your food. Money. Frying food in expensive oils, like olive, is a waste of money. Save your nice oils for salad dressings and lower heat cooking. 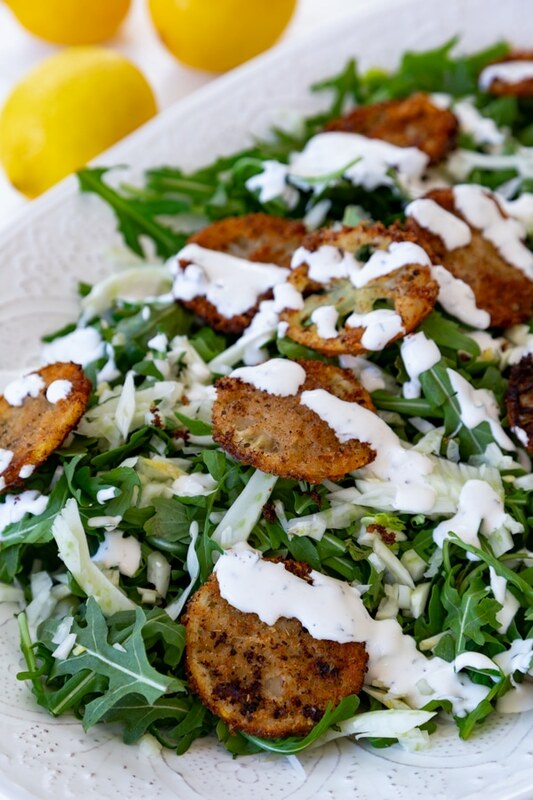 Breaded fried lemons go so well when paired with a fresh salad. We especially love them with arugula and shaved fennel. 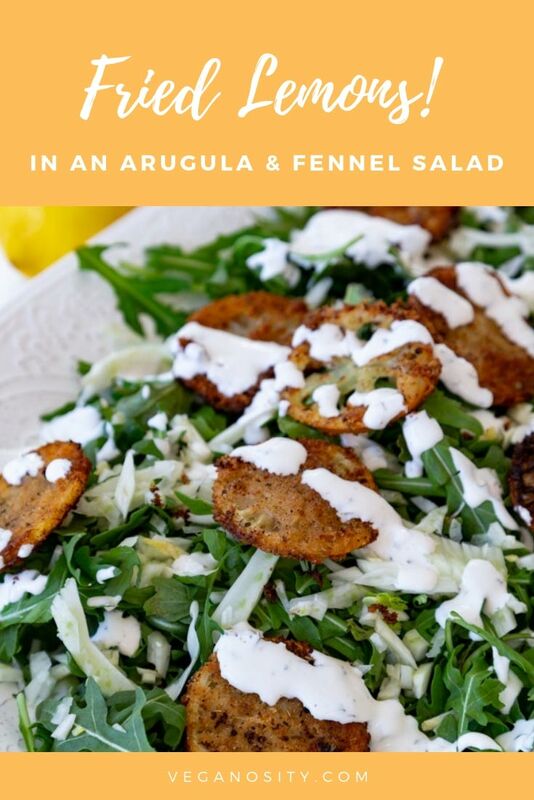 The arugula is nice and peppery and the fennel has a mild licorice flavor. 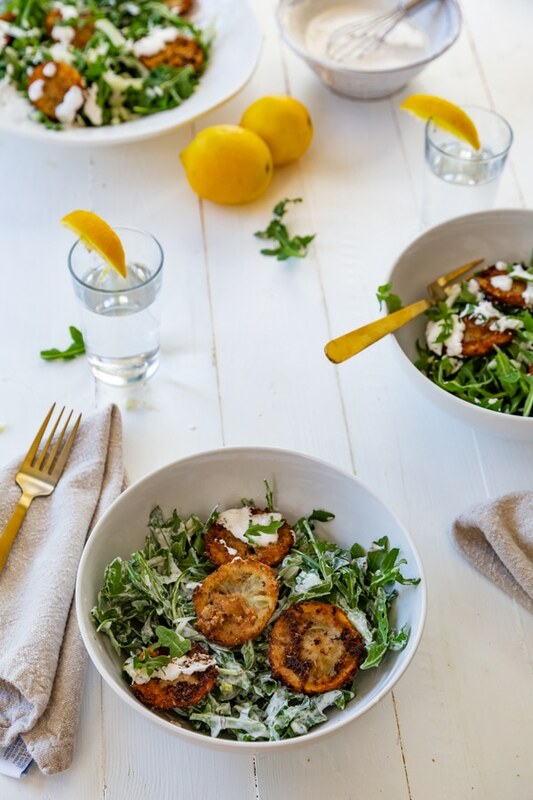 When combined with the sweet and tangy fried lemons and the creamy lemon dressing, the result is so fancy and incredibly delicious. HOW DO YOU SHAVE FENNEL INTO THIN SLICES? Remove the stalks. Cut about one inch below the stalks into the fennel bulb and remove the stalks. Save some of the pretty feathery greens for garnish if you like. Remove the root end of the bulb. Lay the bulb flat and remove the root end about a half inch from the bulb. Shave with a mandoline. Cut the bulb in half and shave the flat end with a mandoline or a box grater. Here’s some great information on fennel. WHAT CAN YOU SERVE WITH FRIED LEMONS? 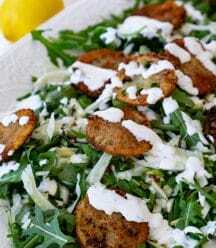 Make our fried lemon recipe with the arugula and fennel salad and let us know what you think. We love to hear from you! And, don’t forget to take a picture of your gorgeous creation and tag us @veganosity on Instagram. 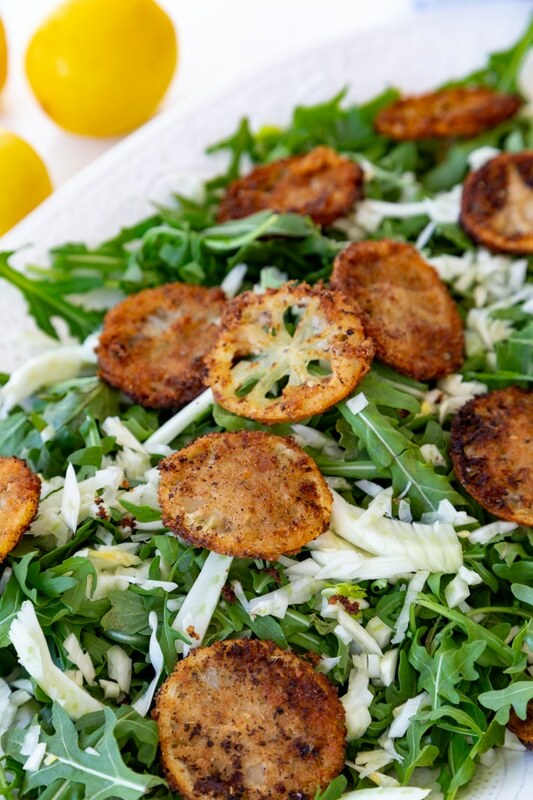 Fried lemons are the star of this salad! They’re slightly sweet, tangy, and crispy. 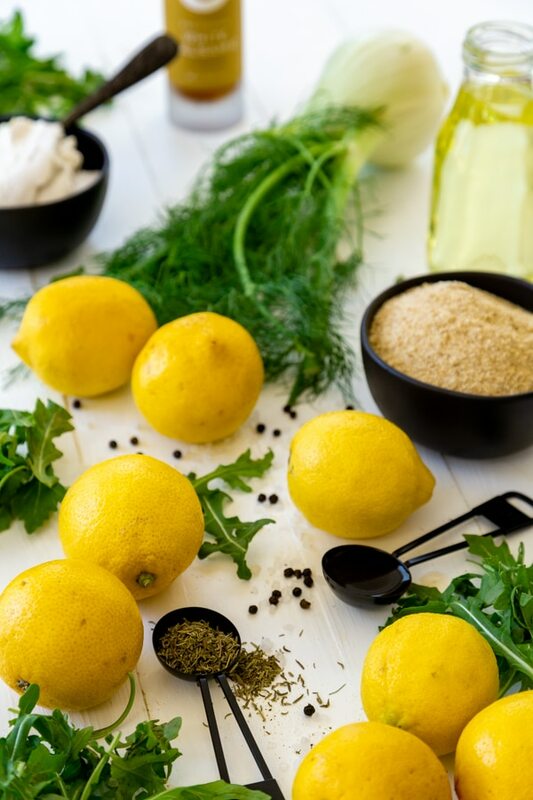 The lemons, paired with the peppery arugula, anise flavored fennel, and the creamy lemon dressing make this salad a food lover’s dream. 2 large lemons Use unwaxed lemons with a thin skin. Meyer lemons work well. Wash and dry the lemons. 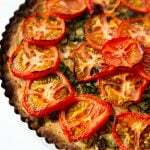 Thinly slice and remove the seeds if needed. We used a mandoline to get perfectly even and thin slices. 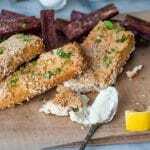 Whisk the cup of breadcrumbs with the 2 tbsp of Italian seasoning and salt and pepper until combined and spread evenly on a plate. 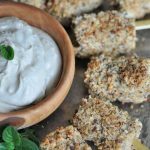 Dip a lemon slice into the ½ cup of milk and then dredge each side in the breadcrumb mixture and gently shake to remove excess crumbs. Heat a heavy skillet on high heat and add the ¼ cup of vegetable oil. When the oil is hot (test by adding a small piece of lemon, if it sizzles, it’s ready), Add the lemons to the oil in batches (use tongs so you don’t burn yourself. Fry the lemons for approximately 1 to 2 minutes, or until both sides (flip once) are a light golden brown. Remove from the oil and place on a wire rack or a plate lined with paper towel to absorb any excess oil. In a small bowl, mix the 1 cup of vegan sour cream, the juice from one lemon, the 2 tbsp of white balsamic vinegar, the 1 tsp of ground thyme, and the ½ tsp sea salt and ¼ tsp black pepper (or to taste), and stir until completely combined. 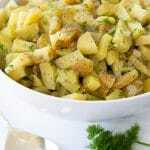 If you want a thinner dressing, add a bit of water until you get the consistency desired. 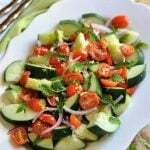 In a large salad bowl, toss the dressing with the arugula and fennel and plate. Put the lemons on top of the salad. This makes four small salads. You said to use flour in the article, but it said bread crumbs in the recipe, itself. Would Grapeseed oil be okay for frying the lemons? Hey Sonia! Thanks for your comment : ) Grape seed oil would work perfectly! Because grape seed oil has a high smoke point and is really mild in flavor it makes for the perfect oil to fry with. Let us know how it goes!